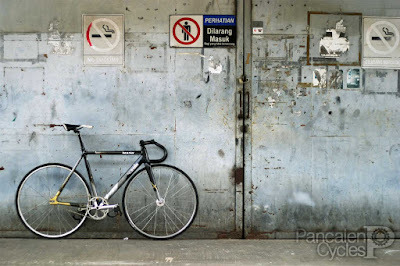 With its extraordinary hilly terrain San Francisco may be one of the most unlikely places for track bikes to flourish, yet on the city’s hills, street riding is reaching one of its ultimate forms of expression. 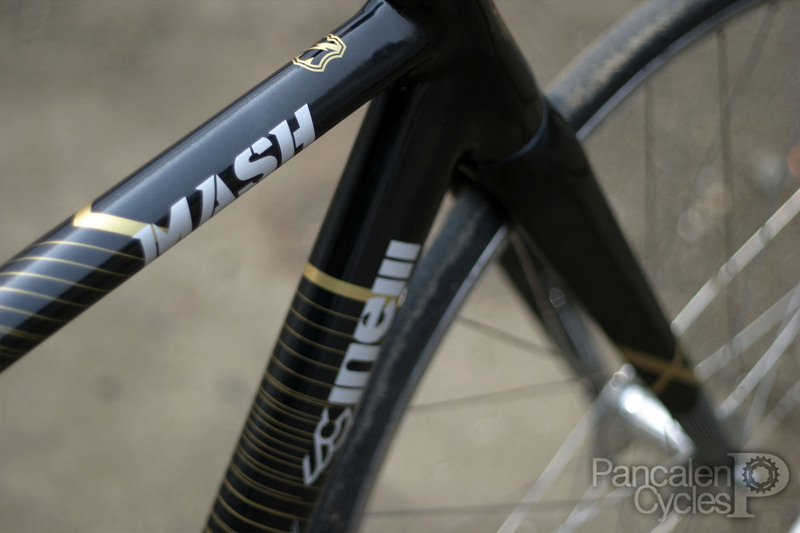 MASH SF, a group of riders from across San Francisco first showed the city’s track-bike potential to the world. Cinelli saw the potential to become the first legendary Italian bicycle manufacturer to embrace the booming urban fixed gear culture. 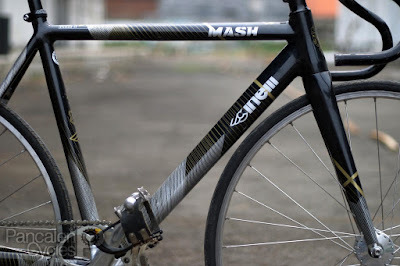 A collaboration with MASH SF resulted with the production of Cinelli x MASH Bolt frame, starting from 2009. To celebrate the MASH SF's tenth anniversary this year, they teamed up with Cinelli to produce a limited batch of 100 Parallax frames, featuring the livery design from the extraordinary talented Garrett Chow. 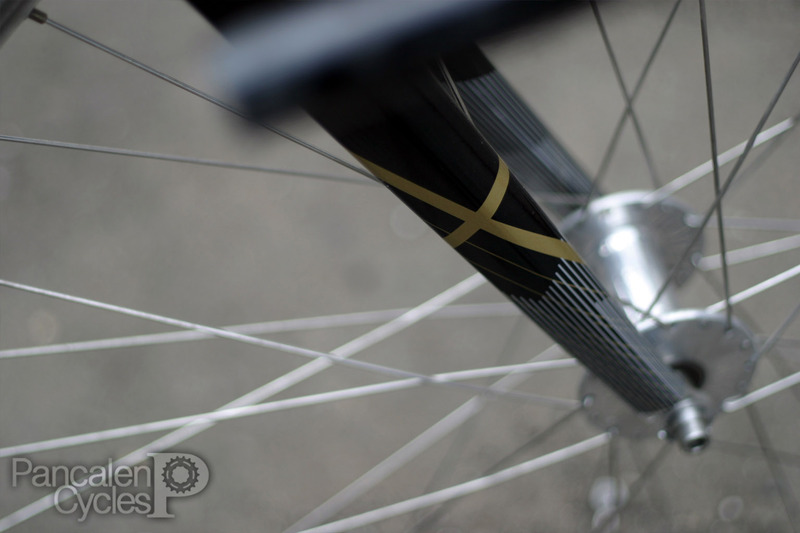 From Mr. Chow himself: "All designs of MASH Ten Year Anniversary products are based on 'X', the Roman numeral for Ten: 'X' is comprised of the intersection of two lines or, can be seen as two angles in tangency. This rationale serves as the basis of the vanishing point(s) in linear perspective—the means for representing three-dimensional objects and space on a two-dimensional surface. The design elements and visual language of all #MASHtenyear products—from premiere flyer to the frameset you see here—are derived from plotting equidistant points along the periphery of the MASH logotype, and then tracing these points back to a vanishing point. Scaling the 'wireframe' derived from this exercise, and varying the distance of the vanishing point and placement of the logotype above and below the horizon line yields myriad permutations of this visual language." 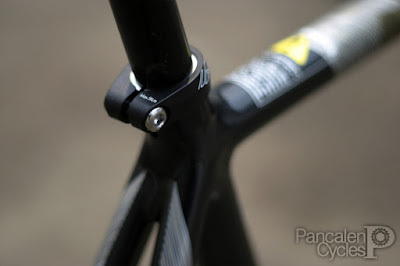 The Cinelli Parallax itself is not an entirely new frame, being produced from 2014/2015. 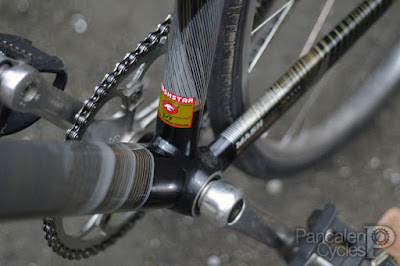 Taking the inspiration from urban-oriented original MASH Bolt but then reworked with true track geometry, the Parallax also took the advantage of tapered headtube—a must-have feature to increase stiffness on the headtube to fork interface, improving handling. 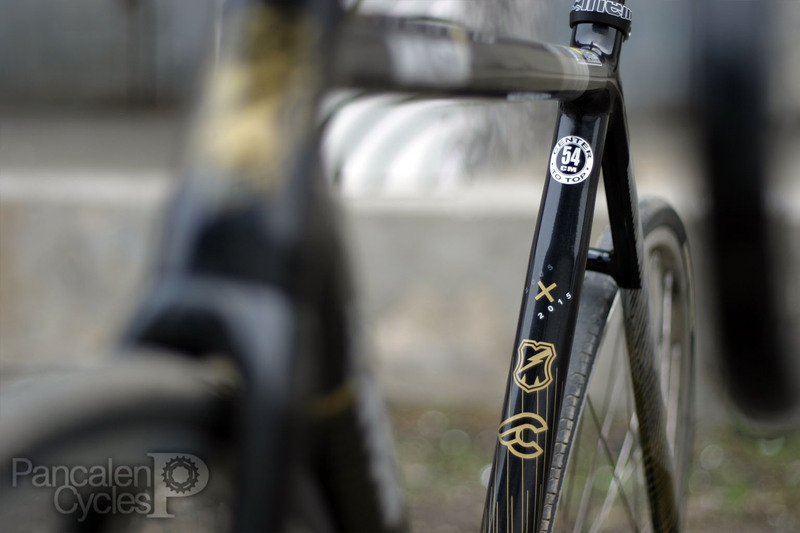 Garrett's "X" concept was delivered in form of crossing golden line shown at the fork, combined with criss-crossing wireframe pattern smothering almost every inch of the frame's rear triangle. Unlike the previous MASH frames, the Parallax used smaller seatpost diameter—probably to compensate for the uber stiff frame. You can see how the seattube tapered near the seat cluster area to accommodate the smaller 27.2mm seatpost. Look closer to the lower section of the seattube and you'll see a dead Columbus bird. 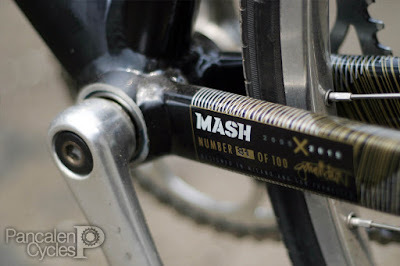 Mike Martin of MASH SF explains about this Columbus logo spoof, "In 2005 Trackstar (a now-defunct bicycle shop based in New York) made a MASH spoof video, NashNYC. We were floored, like, 'Damn, that's like the highest form of flattery!' Trackstar had ripped off the Columbus bird for one of their logos, so as a throwback, we made a Mashstar T-shirt with the Columbus logo dead bird. Third generation copyright infringement! I met Luigi from Cinelli at the first Handmade Bike Show in San Jose, gave him some Ts and a copy of a MASH short. 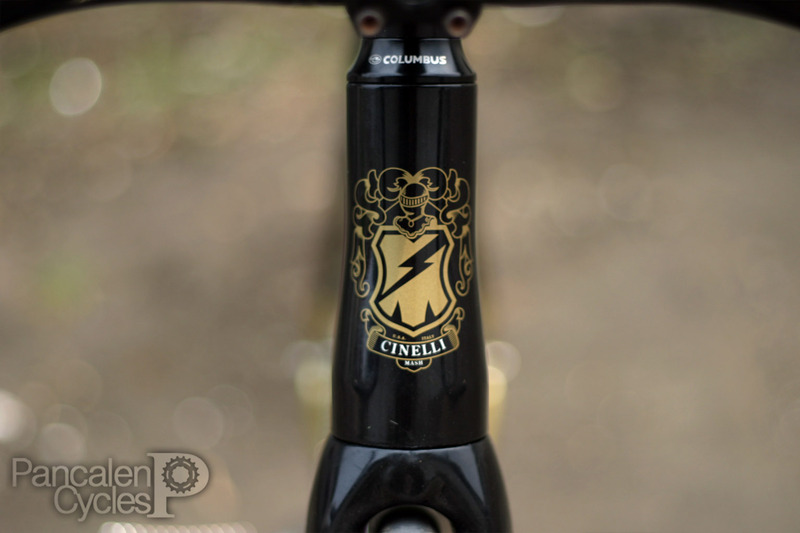 Later, Antonio [Colombo] hit me up and was grossed out, and proud of this circle of logo thieves on classic bikes." 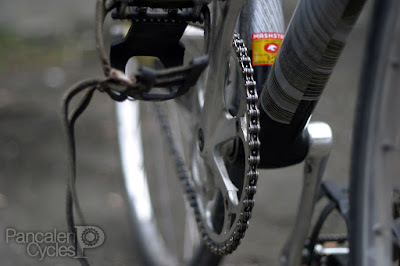 One thing lead to another, and kids, that's how a spoof ended with a long-term collaboration. 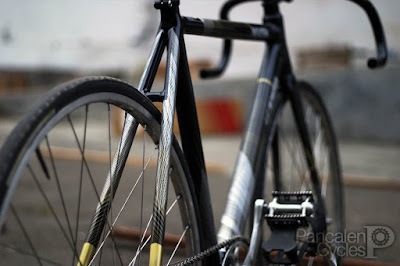 Regi Arfiandi is a Jakartan who's lucky enough to get his hands on this 81st frame. 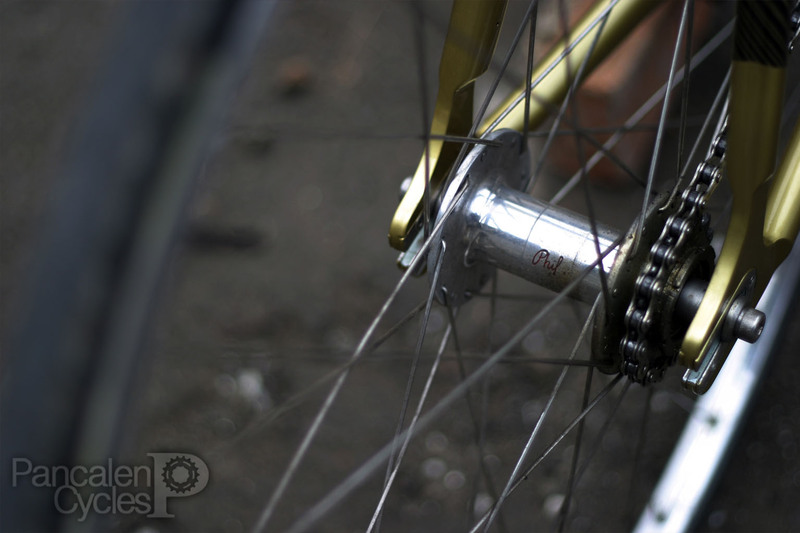 Almost verbatim to the urban track bike recipe back from five years ago, the frame was then built with Phil Wood bottom bracket and hubs, H Plus Son TB14 rims, Sugino RD2 crankset, even down to narrow, 25.4mm bored trackbar.